One of the fun things about living with a 3 or 4 year old is their always-going imagination. My son has been in a pirate phase for months. He walks around with a cup on his foot (his peg leg), his finger curled like a hook and he's even given himself a couple pirate names. Depending on the day, you can call him either Captain Willypanels or Captain Root Beard. 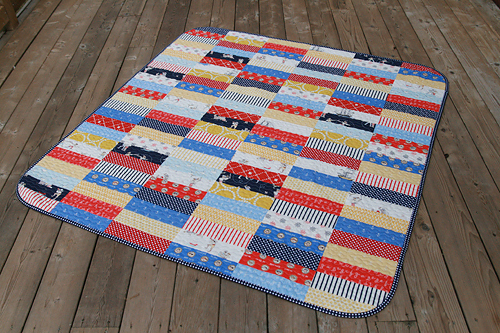 That's why when I saw Sarah Jane Studios fabric line Out to Sea, I knew it would make a perfect quilt for him. This quilt was really easy to make. 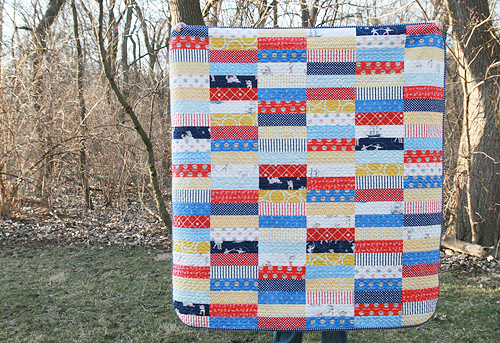 I combined several of the Out to Sea prints with other coordinating fabrics from my stash. These include some of Moda's Mono Pez, Lizzy House's Pearl Bracelets, Sarah Jane's Children at Play, and Aneela Hoey's Little Apples. I think one of the keys to making a quilt that really pops is using different shades of each color. As you can see, there are several obviously different shades of blue. But also, the yellows and reds are different. The prints with the white background give your eye a place to rest. I cut each rectangle 3" x 10" and the quilt has 6 columns and 24 rows, for a total of 144 rectangles. The finished size is 57" x 60". 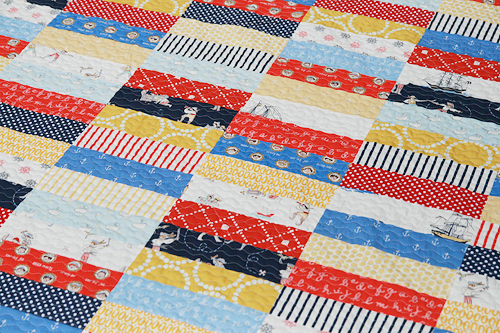 I had a definite picture in my head when I started this quilt, and that vision included rounded corners. I found a circular picture frame in my house that was just the right size, and used that as a template to cut the corners. It's such a nice detail that softens the look of all those rectangles. Just don't forget to use bias binding when you make something with round edges, or your finished product won't lay flat. 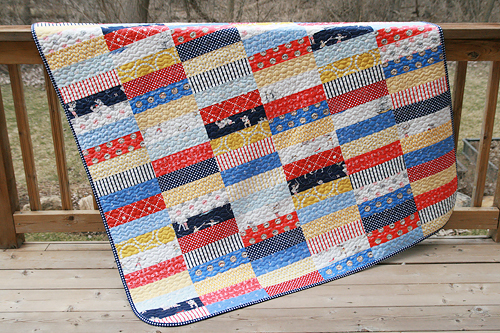 I also knew I wanted to quilt with wavy lines. 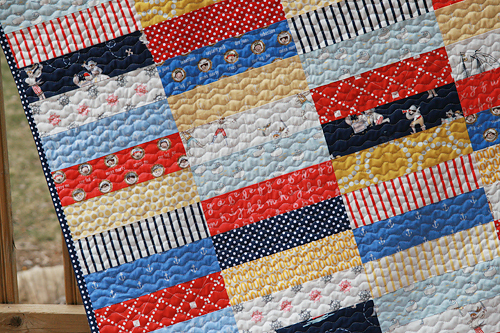 It gives a nice texture and reminds me of the ocean which is perfect for this quilt. I've mentioned this technique before, but as a refresher, I use the Running Stitch on my machine (Bernina stitch #4) and max out the width and set the length to 4.0. I use my walking foot while quilting. 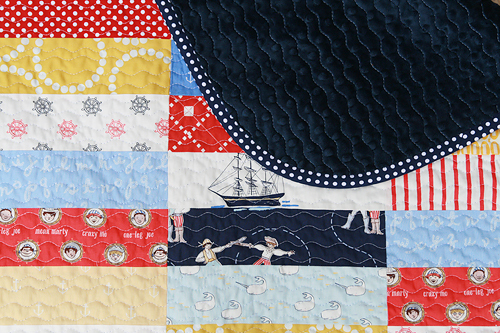 The backing is a dark navy minky, which made for messy quilting! I had to really work the carpet in my sewing room with the vacuum after I was done basting. 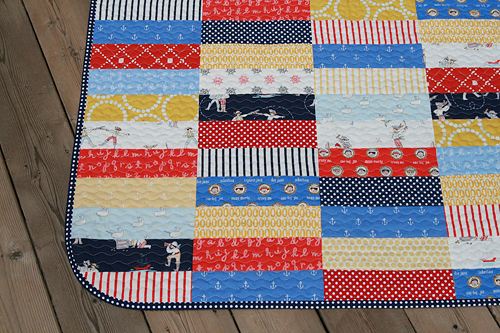 The binding is a dot from Sarah Jane Studios Children at Play line. My son loves the quilt. While I was working on it, he told me he wasn't going to use it. I called his bluff though, and luckily I was right! It's quite a nice feeling to know he's spending time now cuddling under something I've made.